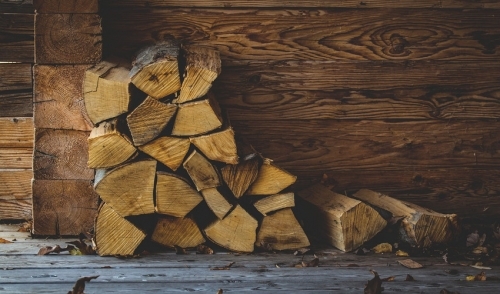 If you have a wood stove or a fireplace in your home, then you more than likely have dealt with the issue of storing your firewood. While the bulk of your wood naturally would be kept outdoors, there needs to be a way of keeping a ready supply indoors near the stove or fireplace. Though a sturdy basket or even a cardboard box will suffice, there’s no reason why your firewood box cannot be an attractive part of your home’s decor. Plywood is an inexpensive and rugged choice, but you really could use any type of wood that you like. With a little stain or paint, maybe a coat of varnish or polyurethane, and you can have a very functional indoor firewood storage box that can be both useful and beautiful. As for the size of the box, remember that if space allows, a bigger box will mean less trips outside (especially at night). A well-designed box can help keep the debris in one place, which makes keeping things neat much easier. Depending on the terrain and distance to the wood pile, attaching wheels to the bottom of one end of the box and a handle on the other end, can make bringing wood inside much easier. Consider wheels that transition well from hard surfaces to carpeting, and won’t damage your wood floors. If you install a lid on the firewood box, you’ll be able to help contain the mess. Make sure you build the box large enough to store wood in a variety of dimensions. You will need smaller sized pieces for starting the fire and larger ones for maintaining it. Making the box large enough so that all the different sizes of wood are accessible at the same time is important. While nearly any wood material can be used to construct a firewood storage box, remember that it must be sturdy. If you are going to use plywood, you should use at least ¾ inch for the sides and the bottom. Make sure to use pieces of 2 x 2 or 2 x 4 lumber to reinforce the corners. For the sides and lid (if necessary) select plywood with a finished grade on at least one side, especially if you intend to stain and seal the outside of your box. Consider the size of the box and how close to the heat source it will be. It’s important to keep it a safe distance from the stove or fireplace. Building a firewood storage box is a project that could be tackled by most homeowners, with basic tools that are readily available. It’s also an excellent opportunity to encourage young helpers to assist. Add your own creative touches to make your firewood box a unique addition to your homes décor. If you’re ready to start building, stop in and we will help you find the materials and tools that you will need to get your project done quickly and safely.